Soon when you logout of Facebook, you could be greeted with a full recreation of the Bing home page, complete with pretty photo and an active search box. Facebook has wasted no time launching the new logout page ad unit it unveiled on Wednesday. This morning TechCrunch reader and MyJobLinx co-founder Raj Singh’s Facebook logout page featured a Bing search box that when used opened a Bing search results page in a separate tab. 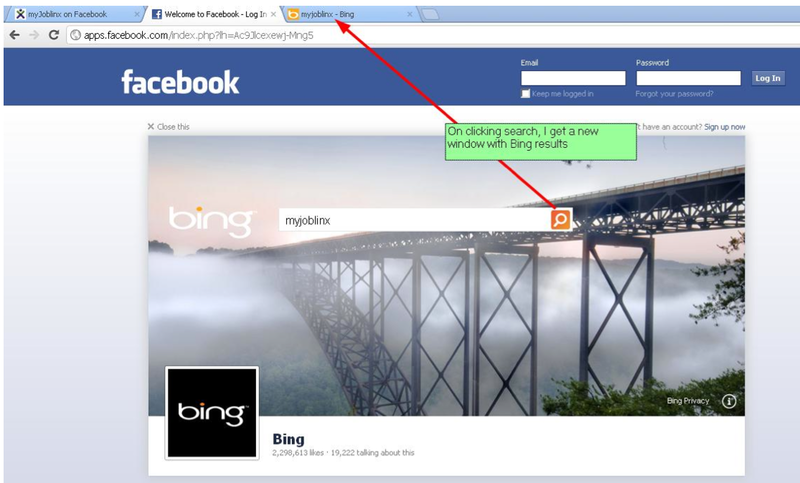 [Update: Facebook has confirmed that Bing is the first advertiser to use its new logout page ad unit.] The new featured placement for Bing stems from Facebook’s longtime partnership Microsoft, where Microsoft is an investor and provided display ads, Bing powers the social network’s internal search engine and other features, and Facebook contributes data to Bing’s own social search features. Facebook’s latest monetization strategies focus on exposing users to more ads without taking away from their social experience. Because there is no social content on the logout page and people usually just wait for it to show up as a confirmation of their logout before navigating away, Facebook may see little harm in displaying an ad or sponsored functionality there. On Wednesday Facebook announced a new logout ad unit where advertisers could pay to have their Page posts displayed. It noted that 37 million people logout of Facebook each day in the US alone, and 105 million per month. This new ad unit is supposed to go live in April, but now Facebook tells me the Bing search experience is its live debut. When Singh tried clicking the ‘close this’ button in the top left, he was shown the traditional Facebook logout page. There’s no information available right now about how Facebook would decide whether to show a Page post Sponsored Story ad or the Bing experience, though the latter could appear to users who don’t meet ad targeting critieria. Bing’s current integration with Facebook is relatively buried in its internal search. This is much more prominent and could help Bing strengthen its position as an alternative to Google. When you logout of Facebook, there’s a decent chance a web search is your next move. This makes Bing’s engine the most obvious choice.